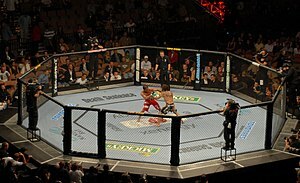 This is a list of events held and scheduled by the Ultimate Fighting Championship (UFC), a mixed martial arts promotion based in the United States. UFC's first event, UFC 1, took place on November 12, 1993. Each UFC event contains several fights. Traditionally, every event starts off with a preliminary card followed by a main card, with the last fight being known as the main event. UFC events are separated into seven different formats: Most of the "numbered" events have taken place on pay-per-view, though there have been a few exceptions for reasons such as tape-delay. Events such as UFC 72, which took place in Belfast, Northern Ireland, U.K., were sold on pay-per-view, but due to tape-delay, purchase rates were not as high as events that aired at a traditional starting time. As such, events taking part in significantly different time zones, including UFC 70, UFC 75, UFC 89, UFC 95, UFC 105, UFC 120, UFC 122, and UFC 138, were given a same-night airing in American prime time on Spike. This is a list of events held and scheduled by the Ultimate Fighting Championship (UFC), a mixed martial arts promotion based in the United States. UFC's first event, UFC 1, took place on November 12, 1993. Each UFC event contains several fights. Traditionally, every event starts off with a preliminary card followed by a main card, with the last fight being known as the main event. Most of the "numbered" events have taken place on pay-per-view, though there have been a few exceptions for reasons such as tape-delay. Events such as UFC 72, which took place in Belfast, Northern Ireland, U.K., were sold on pay-per-view, but due to tape-delay, purchase rates were not as high as events that aired at a traditional starting time. As such, events taking part in significantly different time zones, including UFC 70, UFC 75, UFC 89, UFC 95, UFC 105, UFC 120, UFC 122, and UFC 138, were given a same-night airing in American prime time on Spike. Historically, the UFC has also aired preliminary fights prior to the main fight cards, either on television via Spike, FX, and Fuel TV, or online via Facebook and YouTube. Beginning in August 2013, starting with UFC Fight Night: Shogun vs. Sonnen, the UFC began airing non-PPV events on either Fox Sports 1 or Fox Sports 2. In January 2014, as part of the organization's global expansion, the UFC began airing various international events exclusively on their subscription-based digital network, UFC Fight Pass. In July 2009, the UFC held its unofficial 100th "numbered event"; however, officially, despite being called UFC 100, it was actually the 101st numbered event (not to mention the 133rd event overall). The UFC signed a deal with Fox Sports Net, after Fox agreed to broadcast one fight in June 2002, during its "All-Star Summer" that month. UFC 37 and 38 had already been scheduled and promoted, but as UFC 38 was the promotion's debut in the United Kingdom, they created UFC 37.5; an event that became the first ever mixed martial arts fight available on cable television. As of UFC Fight Night: Błachowicz vs. Santos, which took place on February 23, 2019, there have been 468 UFC events held in 150 cities in 26 countries. In May 2017, the UFC announced White would hold Dana White's Tuesday Night Contender Series weekly on UFC Fight Pass (Will begin on ESPN+ in 2019). As with the earlier web series Looking for a Fight, the goal of the series is for White to scout talent for the UFC. It was stated ahead of the license being approved that “this is not the UFC, this is not the UFC brand,” but instead a promotion that will allow up and coming fighters the chance to showcase their talents in hopes that one day they may compete in the UFC. As of UFC Fight Night: Błachowicz vs. Santos. ↑ "Who is the biggest UFC PPV draw part 5". mmapayout.com. September 8, 2010. ↑ "Spike TV announces 8p.m. ET/PT start time for Saturday's UFC 120 event". mmajunkie.com. October 13, 2010. ↑ "'UFC Fight Night 27: Condit vs. Kampmann 2' lineup set with FOX Sports 2 prelims". ↑ Staff (2013-12-02). "UFC to unveil digital network for global expansion". USAtoday.com. Retrieved 2013-12-02. 1 2 "UFC 37 (And 37.5, too)". sports.yahoo.com. Retrieved October 13, 2010. ↑ Staff (2017-05-12). "Dana White's Tuesday Night Contender Series Launches on Fight Pass". Ultimate Fighting Championship. Retrieved 2017-06-22. ↑ Staff (2017-05-13). "'Dana White's Tuesday Night Contender Series' debuts July 11 on UFC Fight Pass with 5 live fights a week". mmajunkie.com. Retrieved 2017-05-13. ↑ "Dana White receives promoter's license for new contender series separate from UFC". 14 June 2017. Retrieved 20 February 2018. 1 2 3 "UFC® Announces Second Quarter 2019 Event Dates". espnmediazone.com. 2018-12-29. Retrieved 2018-12-29. ↑ "UFC returns to Chicago: United Center will host pay-per-view event in June". Chicago Sun-Times. Retrieved 2019-02-10. ↑ Lennart Van Arendonk. "UFC returns to Stockholm on 1 June". mmadna. Retrieved 2019-02-24. ↑ Jesse Holland (2019-02-20). "UFC Ottawa official for May 4 on ESPN+". mmamania.com. Retrieved 2019-02-20. ↑ Hiergesell, Dan (2019-02-23). "UFC On ESPN 3 Receives Venue Change". MMAmania.com. Retrieved 2019-02-24. ↑ DNA, MMA. "Alexander Volkov vs. Alistair Overeem is het Main Event voor UFC St.Petersburg". Retrieved 2019-02-09. ↑ "Max Holloway returns at UFC 236 for interim lightweight title fight with Dustin Poirier | BJPenn.com". www.bjpenn.com. Retrieved 2019-02-23. ↑ "UFC Fight Night coming to Wells Fargo Center in March". The Inquirer. 2019-01-08. Retrieved 2019-01-08. ↑ "UFC announces 2019 first quarter schedule: ESPN debut Jan. 19 in Brooklyn". MMAjunkie. 2018-11-04. Retrieved 2018-11-04. ↑ "The UFC is coming to Wichita. Here are some details for the March event". Kansas.com. 2018-12-29. Retrieved 2018-12-29. ↑ "UFC Prague draws announced 16,583 attendance for $1.6 million gate". MMAjunkie. 2019-02-23. Retrieved 2019-02-23. ↑ "UFC on ESPN 1 results: Francis Ngannou stuns Cain Velasquez in just 26 seconds". MMAjunkie. 2019-02-18. Retrieved 2019-02-18. ↑ "UFC 234 draws announced 15,238 attendance for $2.47 million live gate in Melbourne". MMAjunkie. 2019-02-10. Retrieved 2019-02-10. ↑ Fuentes, Jon (2019-02-03). "UFC on ESPN+ 2 Bonuses & Attendance Revealed • MMA News". mmanews. Retrieved 2019-02-03. ↑ Newswire, MMA Fighting (2018-12-12). "UFC cancels UFC 233 card in Anaheim". MMA Fighting. Retrieved 2019-02-03. ↑ "UFC on ESPN+ 1 draws announced 12,152 for $1.23 million live gate in Brooklyn". MMAjunkie. 2019-01-20. Retrieved 2019-01-20. ↑ "UFC 232 draws announced 15,862 attendance for $2 million live gate". MMAjunkie. 2018-12-30. Retrieved 2018-12-30. ↑ "UFC on FOX 31 draws announced 9,010 fans for $616K live gate in Milwaukee". MMAjunkie. 2018-12-16. Retrieved 2018-12-16. ↑ "UFC 231 draws announced sellout of 19,039 for $2.4 million live gate in Toronto". MMAjunkie. 2018-12-09. Retrieved 2018-12-09. ↑ "UFC Fight Night 142 draws reported 8,652 attendance in Australia". MMAjunkie. 2018-12-02. Retrieved 2018-12-02. ↑ "The Ultimate Fighter 28 Finale Attendance and Gate Numbers from Las Vegas | MMAWeekly.com". www.mmaweekly.com. Retrieved 2018-12-01. ↑ "UFC Fight Night 141 draws reported 10,302 attendance in Beijing". MMAjunkie. 2018-11-24. Retrieved 2018-11-24. ↑ "UFC Fight Night 140 draws announced 10,245 attendance for Argentina debut". MMAjunkie. 2018-11-18. Retrieved 2018-11-18. ↑ "UFC Fight Night 139 draws announced 11,426 attendance for $946,700 live gate". MMAjunkie. 2018-11-11. Retrieved 2018-11-11. ↑ "UFC 230 draws announced 17,011 attendance for $2.8 million live gate". MMAjunkie. 2018-11-04. Retrieved 2018-11-04. ↑ mmajunkie staff (2018-10-28). "UFC Fight Night 138 draws reported 6,282 attendance for $692k CAD live gate". mmajunkie. Retrieved 2018-10-28. ↑ "UFC 229 Bonuses, Live Gate & Attendance Revealed • MMA News". MMA News. 2018-10-07. Retrieved 2018-10-07. ↑ "UFC Fight Night 137 draws announced 9,485 fans in Sao Paulo". MMAjunkie. 2018-09-23. Retrieved 2018-09-23. ↑ "UFC Fight Night 136 draws reported 22,603 attendance for $1.84 million live gate". MMAjunkie. 2018-09-15. Retrieved 2018-09-15. ↑ "UFC 228 draws announced 14,073 attendance for $1.7 million live gate". MMAjunkie. 2018-09-09. Retrieved 2018-09-09. ↑ "UFC Fight Night 135 draws reported 6,409 attendance for $478k live gate". MMAjunkie. 2018-08-26. Retrieved 2018-08-26. ↑ "UFC 227 draws announced 17,794 attendance for $2.85 million live gate". MMAjunkie. 2018-08-05. Retrieved 2018-08-05. ↑ "UFC on FOX 30 draws announced 10,603 attendance for $1.3 million gate in Calgary". MMAjunkie. 2018-07-28. Retrieved 2018-07-28. ↑ "UFC Fight Night 134 draws reported 7,798 attendance for $750,000 live gate". MMAjunkie. 2018-07-22. Retrieved 2018-07-22. ↑ "UFC Fight Night 133 draws announced 5,648 sold-out attendance in Boise debut". MMAjunkie. 2018-07-15. Retrieved 2018-07-15. ↑ "UFC 226 draws announced attendance of 17,464 for $5.677 million live gate". MMAjunkie. 2018-07-08. Retrieved 2018-07-08. ↑ "TUF 27 Finale post-fight bonuses: Adesanya wins rare POTN bonus without a finish". Bloody Elbow. Retrieved 2018-07-07. ↑ "UFC Fight Night 132 draws announced 6,419 attendance in Singapore". MMAjunkie. 2018-06-23. Retrieved 2018-06-23. ↑ "UFC 225 draws announced 18,117 fans for $2.55 million gate in Chicago". MMAjunkie. 2018-06-10. Retrieved 2018-06-10. ↑ "UFC Fight Night 131 draws announced 5,063 attendance for $322,825 gate in Utica". MMAjunkie. 2018-06-02. Retrieved 2018-06-02. ↑ Staff (2018-05-27). "UFC Fight Night 130 draws reported 8,520 attendance for $1.3 million live gate". mmajunkie.com. ↑ Staff (2018-05-20). "UFC Fight Night 129 attendance: Chilean debut draws announced 11,082 fans". mmajunkie.com. ↑ Staff (2018-05-13). "UFC 224 draws announced 10,696 fans in Rio de Janeiro". mmajunkie.com. ↑ Staff (2018-04-22). "UFC Fight Night 128 draws reported 9,541 attendance for $923,720 live gate". mmajunkie.com. ↑ Staff (2018-04-14). "UFC on FOX 29 draws announced 11,382 attendance for $1.09 million live gate". mmajunkie.com. ↑ Staff (2018-04-08). "UFC 223 draws reported 17,026 attendance for $3 million live gate". mmajunkie.com. ↑ Staff (2018-03-17). "UFC Fight Night 127 draws announced 16,274 attendance for $2,028,000 live gate". mmajunkie.com. ↑ Staff (2018-03-04). "UFC 222 draws announced 12,041 attendance for $1,367,672 live gate in Las Vegas". mmajunkie.com. ↑ Matt Erickson (2018-02-25). "UFC on FOX 28 draws reported 10,124 attendance for $1.064 million live gate in Orlando". mmajunkie.com. ↑ Staff (2018-02-19). "UFC Fight Night 126 draws announced 10,502 fans for $794,350 live gate in Austin". mmajunkie.com. ↑ Staff (2018-02-11). "UFC 221 attendance: Perth debut reportedly draws highest sporting gross in venue history". mmajunkie.com. ↑ Staff (2018-02-04). "UFC Fight Night 125 draws announced 10,144 attendance in Belem, Brazil". mmajunkie.com. ↑ Staff (2018-01-28). "UFC on FOX 27 draws announced 10,249 attendance for $944,000 gate in Charlotte". mmajunkie.com. ↑ Staff (2018-01-21). "UFC 220 draws announced 16,015 attendance for $2.45 million gate in Boston". mmajunkie.com. ↑ "UFC Fight Night 124 draws announced attendance of 10,052 for $812,995 live gate in St. Louis". MMAjunkie. 2018-01-15. Retrieved 2018-01-15. ↑ Staff (December 31, 2017). "UFC 219 draws announced 13,561 fans for $1.76 million live gate in 2017 finale in Las Vegas". mmajunkie.com. ↑ Staff (December 16, 2017). "UFC on FOX 26 draws reported 8,862 attendance for $781k live gate". mmajunkie.com. ↑ Staff (December 10, 2017). "UFC Fight Night 123 draws reported 7,605 attendance for $568,290 live gate in Fresno". mmajunkie.com. 1 2 Staff (December 3, 2017). "UFC 218 draws reported 17,587 attendance for $2 million gate". mmajunkie.com. ↑ Staff (November 19, 2017). "UFC Fight Night 121 draws announced 10,021 fans in Sydney". mmajunkie.com. ↑ Staff (November 12, 2017). "UFC Fight Night 120 attendance: Event stands as most attended UFC card in Virginia". mmajunkie.com. ↑ Staff (November 5, 2017). "UFC 217 draws reported 18,201 attendance for $6.2 million live gate in Madison Square Garden return". mmajunkie.com. ↑ Staff (October 29, 2017). "UFC Fight Night 119 draws announced 10,265 fans in Sao Paulo". mmajunkie.com. ↑ Staff (October 21, 2017). "UFC Fight Night 118 draws announced 11,138 attendance in Poland". mmajunkie.com. ↑ Staff (October 8, 2017). "UFC 216 draws announced attendance of 10,638 for $677,999.50 live gate in Las Vegas". mmajunkie.com. ↑ Staff (September 23, 2017). "UFC Fight Night 117 draws reported 8,571 attendance in Japan". mmajunkie.com. ↑ Staff (September 17, 2017). "UFC Fight Night 116 draws announced crowd of 7,005 in Pittsburgh for lowest 2017 live gate". mmajunkie.com. ↑ Staff (September 9, 2017). "UFC 215: Nunes vs. Shevchenko 2 gate and attendance from Edmonton". mmaweekly.com. ↑ Staff (September 2, 2017). "UFC-Rotterdam attendance takes slight dip from Dutch debut". mmajunkie.com. ↑ Staff (August 6, 2017). "UFC Fight Night 114 draws reported 10,172 attendance in Mexico City". mmajunkie.com. ↑ Staff (July 30, 2017). "UFC 214: Cormier vs. Jones 2' sets UFC-Honda Center attendace record". mmajunkie.com. ↑ Staff (July 23, 2017). "UFC on FOX 25 draws reported 11,198 attendance for $1.1 million live gate". mmajunkie.com. ↑ Staff (July 16, 2017). "UFC Fight Night 113 attendance: Return to Glasgow draws bigger crowd than debut". mmajunkie.com. ↑ Staff (July 9, 2017). "UFC 213 draws announced attendance of 12,834 for $2.4 million live gate in Las Vegas". mmajunkie.com. ↑ Staff (July 8, 2017). "TUF 25 Finale draws reported 6,308 attendance for $432,495 live gate". ↑ Staff (June 26, 2017). "UFC Fight Night 112 draws reported 7,605 attendance for $549,302 live gate". mmajunkie.com. ↑ Staff (June 17, 2017). "UFC Fight Night 111 draws reported 8,414 attendance for $839,300 USD live gate". mmajunkie.com. ↑ Staff (June 11, 2017). "UFC Fight Night 110 draws announced crowd of 8,649 for live gate near $830K". mmajunkie.com. ↑ Staff (June 4, 2017). "UFC 212 attendance draws announced attendance of 15,412 for undisclosed live gate". mmajunkie.com. ↑ Staff (May 28, 2017). "UFC Fight Night 109 attendance: Stockholm draws another solid crowd". mmajunkie.com. ↑ Staff (May 14, 2017). "UFC 211 draws announced attendance of 17,834 for $2,662,645 live gate in Dallas". mmajunkie.com. ↑ Staff (April 23, 2017). "UFC Fight Night 108 attendance: Event sets UFC-Nashville live-gate record". mmajunkie.com. ↑ Staff (April 15, 2017). "UFC on FOX 24 attendance: Thrilling card proves highest-earning sports event in venue history". mmajunkie.com. ↑ Staff (April 9, 2017). "UFC 210 draws announced 17,110 attendance for KeyBank Center sports record $2 million gate". mmajunkie.com. ↑ Staff (March 18, 2017). "UFC Fight Night 107 draws announced 15,761 fans for gate north of $2 million in London". mmajunkie.com. ↑ Staff (March 12, 2017). "UFC Fight Night 106 draws announced attendance of 14,069 for sell-out in Fortaleza, Brazil". mmajunkie.com. ↑ Staff (March 4, 2017). "UFC 209 draws announced 13,150 attendance for live gate of $2.385 million in Las Vegas". mmajunkie.com. ↑ Staff (February 20, 2017). "UFC Fight Night 105 draws reported 8,123 attendance for $575,832 live gate". mmajunkie.com. ↑ Staff (February 12, 2017). "Sold-out UFC 208 draws announced 15,628 fans for $2,275,105 live gate, Barclays Center sports record". mmajunkie.com. ↑ Staff (February 5, 2017). "UFC Fight Night 104 draws announced attendance of 8,119 for gate north of $600,000". mmajunkie.com. ↑ Staff (January 28, 2017). "UFC on FOX 23 draws announced attendance of 13,233 for live gate north of $1 million in Denver". mmajunkie.com. ↑ Staff (January 16, 2017). "UFC Fight Night 103 draws 11,589 fans for gate north of $900,000 in Phoenix". mmajunkie.com. ↑ Staff (December 31, 2016). "UFC 207 draws sold-out 18,533 attendance, a Las Vegas UFC record, for $4.75 million live gate". mmajunkie.com. ↑ Staff (December 17, 2016). "UFC on FOX 22 draws announced attendance of 13,136 for $1,238,992 gate". mmajunkie.com. ↑ Staff (December 11, 2016). "UFC 206 attendance: Event nears highest attendance in UFC's Air Canada Centre history". mmajunkie.com. ↑ Staff (December 9, 2016). "UFC Fight Night 102 attendance dips slightly from promotion's New York debut". mmajunkie.com. ↑ Staff (December 4, 2016). "TUF 24 Finale draws announced 2,044 fans for $188,602 live gate in Las Vegas". mmajunkie.com. ↑ Staff (November 27, 2016). "UFC Fight Night 101 draws announced sell-out of 13,721 for $2.2 million AUD live gate". mmajunkie.com. ↑ Staff (November 20, 2016). "UFC Fight Night 100 draws announced attendance of 9,028". mmajunkie.com. ↑ Staff (November 19, 2016). "UFC Fight Night 99 draws announced attendance of 7,222 for $850,000 live gate in Belfast". mmajunkie.com.